Many early and late–2011 MacBook Pro owners with discrete graphics cards seem to be experiencing GPU failures and system crashes on their machines. In addition to several tips received by MacRumors, there's a lengthy thread on the issue on the Apple Support Communities, a Facebook group, and many reports of trouble on our own forums. Along with graphical issues, MacBook Pro owners are also seeing frequent reboots to a gray screen. Apple has several suggestions for customers seeing a gray screen, including booting into safe mode and reinstalling OS X, which has not managed to solve the problem for MacBook Pro owners experiencing issues. Apple has done logic board replacements in some cases for affected users, but reports indicate that the issue has reoccured after a logic board replacement as well. It is unclear why the MacBook Pros are experiencing problems, but Apple forum users have speculated that it could be heat related. 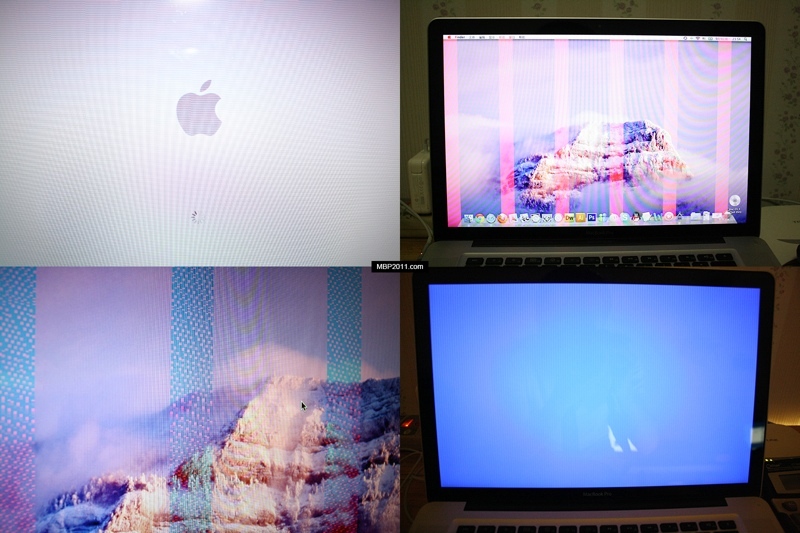 The issue appears to affect 15 and 17-inch MacBook Pros that have discrete graphics cards. All of the 2011 MacBooks use AMD cards, including the AMD Radeon HD 6490M, the AMD Radeon HD 6750M (both 512MB/1GB variants) and the AMD Radeon HD 6770M. Mid–2011 iMacs with AMD Radeon HD 6970 graphics cards experienced similar failures and in August of 2013, Apple initiated a Graphics Card Replacement Program for the computers, replacing the graphics cards of affected iMacs at no cost. Thanks. Good idea. I'll upgrade to a new 17" Macbook pro with Matte display. Nothing to see here guys. I don't think anyone uses a 2011 MBP with ATI graphics anymore anyway? IF they do, its time to upgrade. This is really BAD thing ! Had this problem on my Early 2011 MBP last year. Apple replaced the logic board and battery(!) an no charge under AppleCare. No problem since. Apple should deliver better products or provide better warranty. A 3 year old (2011 you say) computer of 2000 shouldn't crap out randomly and in need of a 500 repair. And when it does Apple should just replace whatever parts necessary free of charge. To those saying this is an isolated incident and that Apple is taking care of it - that is NOT true! There are many people suffering with this issue. Sure Apple is replacing logic boards at the CUSTOMER'S expense, Apple should be replacing them for free. To those that say we should get Apple Care - why should I need an extended warranty to get a quality product? I have never bought Apple Care because I take excellent care of my Macs and in 20+ years have never had an issue that Apple has not taken care of. Like the battery recall on my last laptop. That laptop is now almost 10 years old and still powers up like a champ every day. I love Apple and I love my 15" MBP but please stop saying this is isolated and they are taking care of it. Taking care of it would be a replacement program for the logic board. We're Apple people. We laugh at the PC lemmings because they have to constantly update their computers every other year, while we buy computers designed to last for a decade because they're built with quality parts and durability in mind. ...then sell them off and upgrade every other year to get the latest and greatest. Ask Microsoft about Nokia Lumia high end users left without wp8 upgrade after ONE year from purchase. You can install and use iOS 7 on the old iPhone 4 while HTC One X+ users cannot upgrade to kitkat after one year and half from phone release. Dude are you here to give someone English lessons ? Would you like to try to post in Italian, or German if you prefer ? I'm simply saying you're jumping down that guy's throat about something he said about planned obsolescence when I can't even understand what you're trying to say in half that response. But what is obvious to me is that you literally hate Microsoft and therefore do not have a non-biased perspective on Apple products. You deny that they have ever even made defective ones for goodness sake. How can I take your posts seriously with that kind of perspective? Btw your post in totally off topic and a very poor flame attempt. Sorry, I don't get on here to flame so therefore there was no flame "attempt". I do get very tired of fanatical arguments that depend on emotion rather than logic, however. I own three Macs currently and one PC, but I do not pretend Apple is without flaws like some on here. I do, however, have a more balanced perspective about Windows since I do actually use it sometimes. I do prefer OSX, but it is not without its flaws just the same. I could make a list right now if you like. It was used as an adjective to describe the type of banter present. In other words, I was describing your argument, not YOU personally. Besides, I didn't know a form of "fanatic" was a bad word. It simply indicates emotional attachment rather than a logical perspective. There's nothing wrong with that except when you try to argue logically about something that is clearly emotionally charged. If you "hate" Microsoft, how can you judge their products now or in the future without bias? You cannot and therefore I cannot take your arguments seriously since simply saying "BS" is not an argument, just a statement of anger. Microsoft makes operating systems ? Yes, crapware like Windows .... Never on any of my computers. Crapware? You've just proven my point about have an emotional argument rather than a logical one. I'm sure reporting me to the moderators for calling your argument fanatical is also an emotional reaction. If you can't afford a Mac, don't buy one. I CAN afford to buy them. What does affordability have to do with quality, though? My entire argument is that a high price should command high quality. But if you cannot admit they have made defective hardware now or in the past, there can be no rational argument made against Apple in that manner since Apple's products are obviously perfect in your eyes. bad quality Apple' s computers exist only in your head.